A Sump Pump for Your Sump Pump! Our line of backup pump systems can ensure you a drier basement. Without a backup sump pump system, a "normal" water problem becomes a much more costly mess. A basement sump pump is a machine, and machines eventually do break down and fail. Parts wear down, screws fall out, wires become frayed and one day you're suddenly without a functioning sump pump. Instead of stockpiling sump pumps and waiting for the primary pump to fail, the easiest way to be prepared is to have a secondary pump and a battery-powered backup pump. We install the sump system and we supply the pump which will be connected by the customer’s plumber. Systèmes Sous-sol Québec has a line of sump pump installations designed to perform under virtually all types of conditions. For the number of styles of sump pumps on the market, there's a matching reason why that pump may lose power. Systèmes Sous-sol Québec has seen everything from tripped circuit breakers and blown fuses to power loss from storms and simply unplugging the system. The outcome for all these situations is the same: flooding, property damage and annoyance. The UltraSump® Battery Backup System by Basement Systems is a solution to be considered. 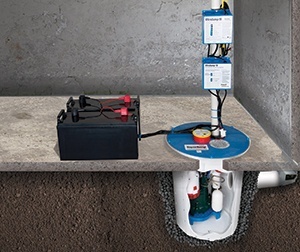 When the UltraSump® pump is fully charged, it can remove nearly 12,000 gallons of water. That's the equivalent of a small-sized swimming pool. The system has an alarm that sounds when it switches on in an emergency and stops when the system turns off. It can pump up to 11,500 gallons of flood water on one battery charge; working longer than the standard battery-powered pump. It alerts the homeowner it is on by sounding an alarm. This gives you time to respond accordingly. The alarm shuts off when the system cycles down. The alarm can also be hooked up to the home alarm system as well. A second battery is easily installed to the system, ensuring water protection during prolonged power outages. By installing a sump pump system and a battery-powered pump, you are giving your basement the added protection it deserves. But if the primary pump was to fail because of mechanical breakdown, you are relying on the longevity of the battery in the back-up pump. Having a secondary, in-line pump eliminates the worry of what happens when the pump breaks and there happens to be a large amount of water at hand.